About the Book: Spring of 1864 brought a whole new war to the Western Theater, with new commanders and what would become a style of warfare. Federal armies, perched in Chattanooga, Tennessee, after their stunning victories there the previous fall, poised on the edge of Georgia for the first time in the war. Atlanta sat at a far distance. Major General William T. Sherman, newly elevated to command the Union’s western armies, eyed it covetously-the South’s last great untouched prize. “Get into the interior of the enemy’s country as far as you can, inflicting all the damage you can against their War resources,” his superior, Lt. Gen. Ulysses S. Grant, ordered. But if Atlanta sat some 100 miles away as the crow flies, it lay more than 140 miles away for the marching Federal armies, which had to navigate snaking roads and treachorous mountain passes. Blocking the way, too, was the Confederate Army of Tennessee, commanded by one of the Confederacy’s most defensive-minded generals, Joseph E. Johnston. All Johnston had to do, as Sherman moved through hostile territory, was slow the Federal advance long enough to find the perfect opportunity to strike. And so began the last great campaign in the West: Sherman’s long and bloody task. 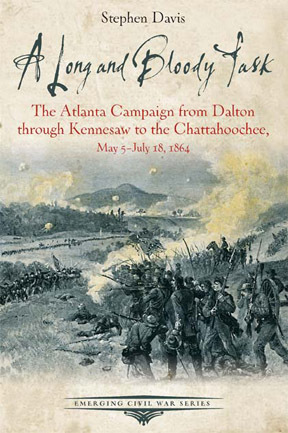 The acknowledged expert on all things related to the battle of Atlanta, historian Steve Davis has lived in the area the majority of his life, and in A Long and Bloody Task, he tells the tale of the Atlanta campaign as only a local can. He brings his Southern sensibility to the Emerging Civil War Series, known for its engaging storytelling and accessible approach to history.